Startup entrepreneurs, CEOs, and venture capitalists joined theBoardlist, Amazon Web Services, and HFA for an informative and interactive event. An experienced panel of CEOs and Independent Directors, such as Julie Bradley, Chairman of the Audit Committee at Blue Apron, offered fresh perspectives on the strategy behind selecting board members. Matthew Bellows; Founder, CEO & Board Member, Yesware, Inc.
A diverse board is proven to lead to improved performance for a company. Find the best candidate for the job, but remember that creating a diverse board should be deliberate. Think outside the box when it comes to making a diverse hire. A candidate with a unique background can bring a fresh perspective to the board. Julie Bradley, board member of Wayfair and Blue Apron: Having served in several CFO positions, including most recently with TripAdvisor, Julie is an example of how independent board members can contribute via proven functional experience – from both board roles as well as their corporate background. Michael George, board member of Continuum: Michael has a successful track record as a CEO – and part of that success stems from the quality of his boardroom. In his experience, independent board members must possess vital and complimentary skillsets that will take the business where it needs to go. Matthew Bellows, Founder and CEO of Yesware, Inc.: Matthew is a start-up CEO, bringing a fresh perspective to the boardroom. 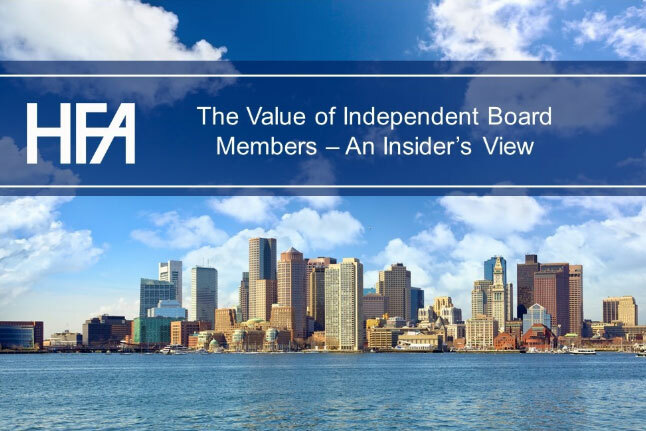 His belief – one echoed by many others in the room – is that while independent board members are valuable for an organization, they must be introduced at the right time. As an organization scales, the boardroom should flex to accommodate the growth. Allison Mnookin, CEO and board member of QuickBase, Inc. and board member of Fleetmatics: As an independent board member of Fleetmatics, Allison brings a range of personal experience based on her current role, as well as previous roles in the industry. This allows her to provide a unique perspective that is rooted in real-life experience. All of this boils down to one key point: You shouldn’t bring on an independent board member unless they can provide real, strategic value to your company. While that is a simple concept, if you heed it, it will have a direct impact on the success of your board member and your company. Board members can be great resources and foster success for a company, but only if they are carefully vetted and selected. We can provide you with the competitive advantage you need by strategically identifying an independent board member who will help your company reach its goals. For more information, contact us at search@hfischer.com or 215.568.8363.